The biggest of North America's herons, the great blue heron has a white face and cap with a black crest, a blue-grey back, black sides and grey-and-white underparts, with plumes that give it a shaggy appearance. While flying — usually in the vicinity of lakes, rivers, ponds and marshes — it crooks its neck in the shape of an "S". The big bold blue heron is the best bird. It is tall. It has lots of feathers and a long straight beak. It has fiery eyes for hunting frogs, fish, snakes, mice and bugs. The heron is grey, white and it has a dark blue hat. It has long legs that look like reeds in the water. When the fish come near, BAM it strikes. The heron is big and it wades slowly through the water. It waits patiently for prey. It comes to Grandpa's farm. When I am at the farm Grandma and I see it fly slowly over the fields. The heron lives in ponds, lakes, rivers, streams and swamps all across Canada. Swamps are very important because they help the community by making homes for ducks, beavers, moose, muskrats and many more animals. They give us fresh clean water. Swamps hold water so that it can soak into the ground for plants and animals to use. Maybe the heron will help people to remember because he hunts in swamps. Like me the heron eats fish and enjoys the water. Canada has lots and lots of lakes and maybe just maybe there is a heron in each one. When I go to the cottage at Lake Skootamatta, I see herons beside the roads in swamps and lakes. I like watching birds. Grandma and I keep a book about the birds I see. I have seen many birds on the farm. There are many birds in Canada, but I think the big blue heron is the best bird for Canada. When I picture my family's annual canoe trips, I see us paddling through a marshy area with a great blue heron rising out of the reeds. It's always a wonderful moment when that majestic bird takes flight. To me it is an icon of our provincial and federal parks. The great blue heron is a majestic and easily identifiable bird of Canada, it lives on every coast. It has a highly disinclined call and I believe is valued in First Nations tradition. The song of the heron is the most hauntingly beautiful sound!!!! In my area, there are a lot of herons and I associate them with hiking, paddle sports, dog walking and any activity that gets me outdoors and enjoying everything Canada has to offer. While I enjoy the red-winged blackbird and the robins as signs of Spring, it is the Heron which gives me joy as I see that slow graceful wingbeat over the ponds. The Great blue heron is distinguished and easily distinguishable. A QUIET, DIGNIFIED, STATUESQUE BIRD, THE BLUE HERRING IS FIGHTER AND SURVIVOR AS ANY PROUD CANADIAN CAN IDENTIFY WITH. My vote is a sentimental one (in truth, I should go for the Common loon, being originally from Northern Ontario myself, but that's another story). The Great blue Heron is the one bird that I have been seeking out every time I travel between Ottawa and Guelph, and I have done this trek more than I care to count since 2001. That's when my partner starting working in Guelph, and I kept my job in Ottawa/Gatineau. For 11 years (2001-2012), almost all year round and except for a couple of winters, I would travel every other week or so from Ottawa to Guelph, a distance of over 500 km one way by way of the 416 and 401 highways, to visit with my partner (she had a more difficult schedule) and stayed a few days, only to drive back again. After taking early retirement in September 2012, we decided to keep a place of residence in each city. As a result, we still make the trip very regularly. Almost every time during the spring, summer and fall, I spot at least one Great blue heron somewhere along on the way to and from Guelph. Somehow, the sight of the big bird, with its slow wing movements, has a soothing, almost reassuring, effect that makes this long and tedious drive that much more easy to endure and process. I am not superstitious by any means, but seeing the Great blue heron, either in flight, or standing on its long legs waiting for food to come by, somehow calms me down just a bit and bids familiarity in any place I might find myself at that moment. So, here's to the Great blue heron!! A large part of my heart wanted to vote for the loon, but there is nothing like canoeing along a peaceful shoreline and coming across the stately Great blue heron. It stands so majestically and it swoops into the sky in a cavalier and majestic way. It's a pity it can't mimic the loon's haunting cry. The Great Blue Heron is a bird that draws your attention for more than a moment of time. It captures one's imagination because of it's stately profile and confident posture. The Great Blue Heron is tall and ruddy much like Canadians who stand tall and are free to speak the truth with integrity and clarity. This bird stands like a sentry as if guarding us from evil and is ever watchful as a watchman on the wall looking out to protect us from danger. We are a country with blue oceans on three sides and a country of many fresh water lakes and marshes the lifeblood of all living creatures. The Great Blue Heron is a metaphor for our fresh water resources and wealth of living creatures that live in them. It is a bird that flies with a mighty wing span a picture of power and grace at the same time. May God continue to bless Canada a land blessed because of our Judeo Christian foundation of truly good values and beliefs and all this who stand firm on those values and beliefs so that judgment doesn't come to Canada and Canadians who turn away and do not repent of our wicked immoral policies. Like the Great Blue Heron may Canada stand tall on solid ground not shifting sand. I believe some of the birds that have the highest votes on this site are represented by individual provinces as the official bird. It would be a better idea to choose a bird for Canada that is not represented as the bird for any of the provinces. I have seen the great blue heron migrating in the spring and fall. It is majestic, strong and works out ways to avoid confrontations with other animals and humans. Does not this describe perfectly Canada and Canadians? The Blue Heron is a majestic bird without being too showy. It is large non-aggressive and quiet, not loud. It reminds of the Canadian character, proud, yet unassuming. My hobby is bird watching and photographing birds. I find that the Great Blue Heron should be Canada's bird as it is so photographic, colourful, funny and is one of my favourites. Although I must say that taking a picture of the Common Yellowthroat Warbler this summer was awesome. It made my day! While many of these birds are tempting to me, I am moved by the Loon and the Chickadee and Osprey particularly. These are already provincial birds. The Great Blue Heron always moves and amazes me and I have seen it in the East, in central and Northern Canada, and understand it to be a National Wetlands bird. I think it is important that it be a bird that one has actually seen ... which lets out for me some of the rarer or nocturnal birds. Unless... we wish to raise up an endangered species bird I suppose, but those have not been separately identified. I voted for my choice. While watching the news I noticed reporter trying to influence the vote by telling us which one to pick for a silly reason. I don't view freedom of choice that way. I decided before Visiting this site which it should be. To me the Great Blue Heron is the most beautiful bird in Canada. At least once a day I see this bird flying in my town of Brooklin,ON and it always brings a smile to my face. They can be hard to capture on camera but when you do get the chance to get a picture you cannot help but admire their beauty. I don't know what it is about the Blue Heron but I just feel it represents Canada's beautiful outdoors, the lakes and ponds. Feel it's a bird missed out and it's beautiful. And a heart that's so love-filled, it's burstin' with pain ..."
- words from a song from the musical, A Day To Remember, words and music by George G. Blackburn, who also produced the musical at Upper Canada Village during summers of 1978 and 1979. I first saw the great blue heron when I was about 5 at my father's cottage on the French River. I thought it was the most majestic, beautiful bird. Ever since then, I've loved seeing them. I often see them in my hometown of Ottawa as, we are near a natural greenbelt. When I was young I was told it is good luck of you see one, it brings good luck, and thy has stuck with me ever since. To me, the great blue heron represents water, and water is such an important commodity and is a resource that is valued and needed by every species. I believe the great blue heron also represents peace and purpose. When I see a great blue heron, it is usually alone and is flying or fishing, both of these things bring me feelings of peace. I love the great blue heron and I think this bird will represent Canada beautifully. The Great Blue Heron can be found coast to coast, represents the importance of protecting our wetlands and waterways, and is gorgeous and graceful... much like the majority of Canadians! I'll have to admit that the loon comes to mind first. Having seen a Great Blue appear out of the early morning mist one day, the is that image of grace and stability that tepresebts Canada, something solud and peaceful. Every once in a while get the opportunity, completely by chance, to watch a heron fly over my head and all I can think is, "I wish I could do that!" When the Great Blue Heron flies, it is majestic and magnificent in its effortless glide. I don't see herons often, but when I do, I am reminded why Canada is so great. Not because of the heron alone, but because there are so many birds that call Canada home, not unlike the number of nationalities that make us who we are. It makes you feel at peace and that you have a place on earth. The heron is a reminder that if nature can be so beautiful, even once in a while, we can aspire to become the best nation on earth by showing a little of that majesty. This beautiful bird stands so tall and stately in every marsh,wetland, pond, stream, river, lake or ocean all across this massive land of ours. There are so many different species of birds to chose from in Canada, it is very difficult. However the Great Blue Heron is a bird that stays alone most of the time and seems just happy in it's own space like most of us here in Canada. It just seems to mind it's own business and enjoy being alive. An iconic bird found in every estuary and bay. This is not an essay, but the Great Blue Heron is beautiful, majestic and a bit gangly. Very endearing and found along shorelines in this great country. The regal, majestic and stoic heron represents much of what makes us proud Canadians. This bird is also ubiquitous coast to coast, resilient and capable. Besides there is a lot of fun in having a national bird that is larger than that one down south. I live along the Rideau Canal which is a natural habitat of the Great Blue Heron. Luckily, I usually see a Great Blue Heron everyday, either strutting up the shoreline or flying with it's enormous 'pterodactyl' wings. Everyone in my family marvels at how prehistoric they look and whenever one shows up, we shout out to let everyone know to look. A stately bird found across the country, patient but able to act quickly as required. The Great Blue Heron is a paragon of patience and calm as he stands in water with an eye locked on to the water waiting for a fish to swim by. In flight it is a thing of beauty and elegance with its trailing legs and long slim neck. A symbol of Canada to be proud of. Great Blue heron is cool. & majestic. Like Canada. When I see a Great Blue Heron, I am always impressed by it's stillness. They are okay when they're alone, yet can be communal also. To me they possess the quiet dignity of this Great country of ours. We are a great nation all on our own, but are a strong ally in the global community. The Great Blue Heron is a majestic and iconic bird that I see frequently here in BC. Its nesting colonies are very impressive. It is the perfect National bird. This bird is dignified, persevering, stoical and determined. It's adventures carry it from coast to coast... could one ask for a better ambassador for Canadians than this elegant bird? The Great Blue Herons are one of my favorite parts of Pelee Island. The Great Blue Heron is a majestic bird with a commanding presence. To see it in flight is a thing of beauty. At the same time, it is an odd and unique looking bird. On countless canoe trips in the past, we would stop everything at the sight of a Great Blue Heron to take it in. We could never get too close, and we would try to keep as quiet as possible to see what it would do and then try to get a photo of its beautiful wings as it flew away. This bird is very majestueuse and I saw it so often. This is our most beautiful bird. I vote for him. The Great Blue Heron is a beautiful bird, and easily recognizable. I always feel very good when I am lucky enough to see one. I love the way these birds are often just ahead of me when I'm canoeing the river. The Great Blue Heron is a silent stalwart figure of wetlands, lakes and oceans all across the country. Its up there with the Loon and is often overlooked due to its quiet presence. In a lot of ways it is more like a Canadian--often overlooked, quiet, reflective but pretty powerful when we need to be. I have lived on the Miama River in Harrison now since 1989-4yrs.The blue herons are here all winter but, it is the spring when they really show up in the huge trees in the mountain behind me.It's fun to watch them fly around together and pick a nest and lay there eggs. I do not wish to write an essay, only vote. This was my grandfather's favourite bird, he saw a few in the field and stopped to admire them, he passed away an hour later. He was so happy that morning seeing them. The Blue Heron, is also engraved on his gravestone. I love him and that bird. I have a wooden carving of one in my living room. Just a peaceful, beautiful bird. I find the great blue heron very interesting. We live in the country with an old irrigation pond on the property. The heron comes fishing almost every day in the spring to late fall. We even have named him Harry Heron. There is one large one that we call the grand daddy ! We watch them with field glasses to get a close up view of how they pluck the fish from the water and swallow it down.. They have very sensitive heating and will take off at the sound or sudden movement.. Despite ther huge size they are a very graceful bird. We are lucky to have them in our back yard. A very patient and graceful bird! The great blue heron is one of the most graceful, magestic and beautiful birds I see while navigating the waterways in my kayak. They are beautiful and pleasant to watch. The Great Blue Heron is one of our most majestic, beautiful and interesting birds. It is worthy of the title "Canada's National Bird." The Great Blue Heron is a classic Canadian bird that is found around urban centres and in the wild. It nests in colonies giving it an aura of congeniality. It is a patient fisher which reflects its Canadian character. There is no other bird as majestic that can be found from the east coast to the west. A strong symbol of peace and wilderness. What stands like a Canadian soldier? Can be even more silent then a sniper, you guessed it the amazing great blue heron. They are strong, sleek and succeed by being patient, alert and stealthy .they know how to strike fast… to win. 1 reason why this bird should be national bird of Canada is the great blue heron is Canada’s most majestic bird as described by bird watchers all around the world and by Audubon society. Another reason why this bird should be the national bird of Canada is that not only is it the tallest standing bird in Canada it does so, like a proud Canadian solider on guard. These birds too, guard their territory from enemies. This native bird lives from coast to coast and nest in our swamps, lakes, rivers and oceans. It is one of the few versatile birds that can live along fresh or salt waters. During my travels around Canada, I always have the great luck of seeing these beautiful birds. Whether I am driving on a highway and they are wading through the water that collects in ditches or running along creeks with a heron flying ahead of me, I always know that I am in a good place because the bird that represents my Canada is there with me. I am in detention because I did not use my class time wisely. My teacher is now helping me to become a better learner through reinforcing the appropriate independent work skills I need so much. I picked the great blue Heron because I think this bird it is so beautiful and a majestic creature in the wild. It can be found in swamps creeks those kind of places. The great blue Heron can fly and is highly adapted to its habitat in the wild. The great blue Heron is a harmless bird, actually, it's scared of you. The great blue heron is a beautiful stilted bird worthy of the spot as Canada's national bird. Toujours fascinée d'observer cet oiseau échassier en sillonnant les lacs du Parc de la Gatineau en kayak, j'anticipe le découvrir dans la région des Laurentides ou j'habite présentement. J'habite près des rapides de Lachine et j'adore regarder voler ces oiseaux majestueux. The great blue heron is an elegant bird that patiently wades in shallow waters, gracing our lakes and rivers. It has a huge wingspan and gracefully swoops along waterways, watching for fish. Sometimes herons will perch high in tree tops, like sentinels guarding their territory. They can be found in many parts of Canada. Landings, lift-offs, strutting...this giant bird gives us many aaaah moments each summer. The fact it purposefully chooses our rickety, old, wooden dock to stop and take a gander, pleases us greatly. Our son has captured it's essence with a long lens. A graceful, majestic bird! I became acquainted with this bird while drawing and painting on the shores of the river by Fairy Falls in Baysville, Ontario. The heron would quietly descend like a ballerina, on one long leg with the other tucked up. It would land right beside me, amidst the tall red flowers at the edge of the river. Then it would ascend as swiftly and quietly as it had appeared. Over a year,it kept me company when I sketched and painted in that beautiful spot. I am voting for the Great Blue Heron as it is a majestic bird that would represent Canada appropriately and it can be seen all across our country. I'm from Vancouver Island, BC, and was lucky enough to grow up on the ocean. 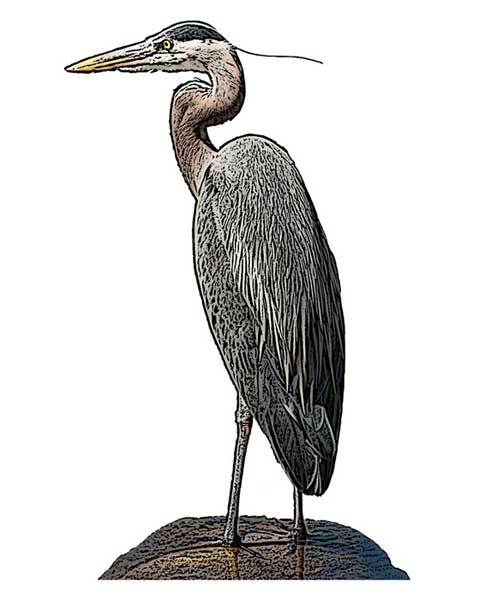 My brother and I have great memories of watching the Blue Herons fish in front of our house, and sit stoically on it's rock or driftwood. Such beautiful, graceful creatures! C'est un oiseau que j'ai eu la chance d'observer à plusieurs reprises alors que j'habitais près du Saint-Laurent. Il en émane beaucoup de dignité et lorsqu'il prend son vol, on ne peut imaginer oiseau plus majestueux. I love taking photos of Great Blue Herons. I live near the water so I see them on a regular basis. Once in a while I get a photo when they've caught a fish, but usually it's a pen point gunnel. I love the patience that the Great Blue Heron exhibits, They also make make fishing look so easy. The grace and majesty of the great blue heron is imminently representative of the vast beauty of Canada. The heron''s stealth is also indicative of the quiet pride of Canadians. I have found this bird graceful,patient,thorough very similar to the best Canadians I have known or met. Everyone already associates the Loon and the Canada Goose to our country. The Great Blue Heron is a most majestic bird. I've been lucky enough to spend some time following one through Algonquin Park. The Great Blue Heron is the shoreline dweller, its silhouette unmistakable even from a great distance. Its contemplative demeanour offers us calm, and it never ceases to surprise and exhilarate when it bows low and takes off over the water, its wings swooping deep. To me the Great Blue is a sign of a healthy shore, and it's a symbol of authority, strength, strategy and timing. I like the blue heron because it rhymes with my name and because it is something I find often. Although the common loon,Canada goose and Canada jay are obviously Canadian birds. I vote for the great blue heron.It is found in a lot of Canada ,it is strong and peaceful and very attractive. It also represents seasonal change as it migrates too. le grand héron parce qu'il est noble, calme et gracieux. Aussi, parce qu'au Québec nous avons la plus grande Héronnière d'Amérique du Nord dans un magnifique écosystème qu'est le Lac Saint-Pierre. Champlain parlait en 1611 du grand héron. The Great Blue Heron is a regal, majestic, highly attentive and very capable bird. It is mostly silent, stoic and imbued with great patience while it seeks out it's prey and yet can be gregarious and social at it's nesting sites. All qualities I believe most Canadians do or should strive for. I believe it exists in most if not all provinces and at some point has likely been seen by most Canadians that go outdoors at all. As an added bonus it is actually bigger than a bald eagle and it never hurts to rub some noses in that. The Great Blue Heron is a regal, impressive, highly attentive and very capable bird. It is mostly silent, stoic and imbued with great patience while it seeks out it's pray and yet can be gregarious and social at it's nesting sites. All qualities and believe most Canadians do or should strive for. I believe it exists in most if not all provinces and at some point has likely been seen by most Canadians that go outdoors at all. As an added bonus it is actually bigger than a bald eagle and it never hurts to rub some noses in that. There is nothing more majestic than the Great Blue Heron in flight. Their enormous wing span and the gracefulness are so impressive! Canada is a very large and impressive country, and so our national bird should be nothing less! I was born & raised in SW Ontario, with a love of the natural world that I renew with trips to campgrounds and daily walks in the meadows and woods in my area. It is always breathtaking to watch the majestic Heron in flight as well as gracefully taking off and landing on the waterways it inhabits. A stately, quiet, calm bird, it exemplifies the Canadian concepts of peace & order...and it covers a lot of territory. I think they are beautiful and majestic!!! A suitably magestic bird that takes your breath away with its beauty found all across Canada. A proud choice, worthy of being our national bird! Great Blue Heron is a beautiful bird, I love to watch then as they prey on their feed.. Love to watch them take flight and go to their destination. Just beautiful. Iit is common for me to encounter Great Blue Herons while out on walks in my neighbourhood and the surrounding areas. I think they're a graceful, magnificent bird and they re,mind me of home. The Great Blue Heron is seen every where and most people have seen them. Whenever I see the great blue heron take off and slowly get airborne I marvel at the sweeping majesty of its flight. I have observed them standing stoically,ingesting a large fish in a few quick gulps in slow graceful flight and the young almost falling out of an over crowded nest. Whatever the circumstance I am always fascinated. I think it would make a fitting symbol for Canada. I see a great Blue Heron every time when I go to the lake (ravine) which is closer to my house. Also I have seen in other lakes in Canada too. I pick this because it is Big and Looks Mighty. It looks old and has a unique hunting strategy. It waits in the water motionless. It does not like disturbance and if the water is disturbed too much it will fly away. It has a special way of tucking it's head /neck over it's shoulders. It is a unique Bird and when they are in the water it is calming to watch them. It is quite a Big Bird and often found alone. Almost like an Old man wandering. Interesting Bird in the water, and therefore I pick this. As a circumpolar species, which is in every time zone of Canada and is even starting to winter over in Southern Canada, I think it is a good choice. I live on a pond in Quebec. The marker of seasons and of the health of the pond, as well as the depth - which we have to fight with the Municipality to keep steady and not break the beaver dams - is the heron. Because it is a beautiful bird, that makes it's home by or beautiful marshlands. Always a pleasure to watch. First bird to introduce me to bird watching. This prehistoric looking bird stealth', And silence, has the ability to transfer fish and water Creatures from Pond to Pond. lt is an ecological balancer. A great representation Of Us quiet yet capable Canadians ! And it meekly creates a sustainable environment . Honestly, after the passing of my mother, I would go for long walks at this lake close to my house almost every day. I've only seen a blue heron in person three times in my life, each time while I was on one of those walks. I remember each of those times so clearly. Blue Herons are absolutely stunning to withhold and carry with them a quiet grace that humbles you so enormously. That is how I want Canada to appear in the global sphere a country with a strong sense of self-concept and ethics that is not imposing and abrasive but gentle and graceful. Sorry, I clearly don't have a way with words but hopefully my meaning is coming through a bit.. The Great blue heron is in every province in Canada. It provides a unique presence to those whom find it. Often found on canoe trips during explorations of Canadian wilderness. When one sees the blue heron it stays in your memory, it recounts a great rencontre with Canadian wilderness. Not aggressive, but present and majestic. That is why to me it is Canada's national bird. Je crois que cet oiseau représente bien le Canada par sa prestance et son élégance. These magnificent birds can be found close to water, silently watching through the surface intently for their next meal. When flying they look like a raptor of times past with their long necks and huge wingspan. I love to see these birds on the rivers, lakes and ocean from my kayak! We have seen this stunning and resourceful bird all across Canada fishing along shores and in marshes in dense cities and in utter wilderness. In flight its grace and dignity are beyond compare - something elegant and ancient about it. I live on Vancouver Island with the good fortune of being very close to two beautiful estuaries which are home to many different species of birds, one being the Great Blue Heron. The Heron has always been a fascination to me with their "old man" hunched shoulder appearance. Rarely do you see them with another heron, but instead they huddle alone in solitude. They are such shy loners that when you approach them they let out a throaty squawk and take off in flight, where like a transformer their appearance changes from old man to prehistoric bird. As an artist I have photographed many of these intriguing birds as well as painted them and never do I tire of them. I walk my little dog at the estuary at least once, sometimes twice a day, and when I see the Great Blue Heron I know my day has been truly blessed. I live on a spit of land that projects out into a calm area of the beautiful Bay of Chaleur between Heron Island and the mainland of northern New Brunswick. Every spring, the Blue Herons return to spend the summer fishing all around my property so I have had many pleasurable years of observing these magnificent birds. They are solitary creatures who prefer to spend their days alone. I have learned to sit very quietly when one approaches if I want to watch them fish. They never miss their shot! The slightest movement on my part and they immediately take flight, screeching out what I'm sure is the bird equivalent of an invective, since they don't seem to be concerned enough about the welfare of other herons to be issuing a warning. These shorebirds would be a wonderful choice for being chosen as our national bird as they are seen in so many areas across our country. Great blue herons appear along both our fresh and salt waterways. I believe the heron is a great representative of Canada, because it can be found from sea-to-sea and it is an appropriately stately and elegant bird, without having the tough-guy image of an osprey or eagle. An awesome and awe-inspiring bird of great size, but also of great grace. A watcher, waiter, then surprisingly fast in action. The great blue heron is deserving of the title of Canada's national bird because of the qualities it quietly displays. The hours of patience while standing on a rock near the ocean's shore or along a river bed, to hunt its next meal. They appear shy, but are not bothered by peering eyes or camera shutters while standing motionless in concentration or working on their majestic nests high in the trees in the centre of Beacon Hill park in Victoria, while hundreds of humans gawk and point. The heron's prehistoric-like screech and delicate body with long flowing wings remind me of a time gone by, and yet they are here now to embrace and admire. I grew up along the shores of the Fraser River. The presence of these glorious birds was everywhere. So many times I would feel I was being watched, yet not glance one unless I perused around carefully and steadily. Everything about them is majestic. From their colour to the plume on the top of their heads. When I was a girl, there was a lot of concern about the survival of this species. They have since been thriving and they never cease to take my breath away every time I see one. They are unique, understated, seem like clowns, and take advantage of many very "Canadian" environmental features. When I spot one of these majestic birds flying overhead, a certain sense of awe overcomes me. Their patience in hunting and the intellect that shines from those sharp eyes make them skilled in the water and sky. 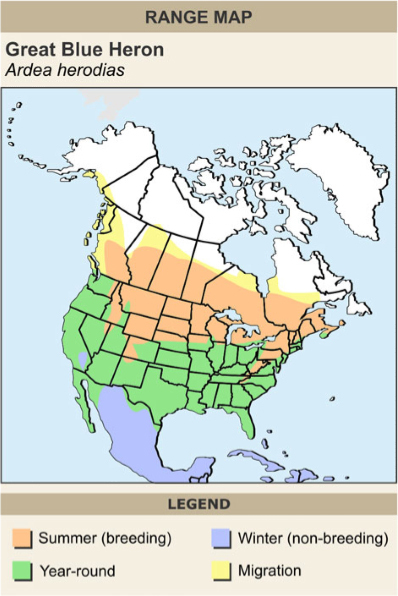 They aren't already a provincial bird and their territory spans most of Canada. They would make a proud emblem as a national bird. I chose the great blue heron because I think its qualities represent what I consider to be Canada's. It's large, beautiful, patient, strong, independent and versatile.